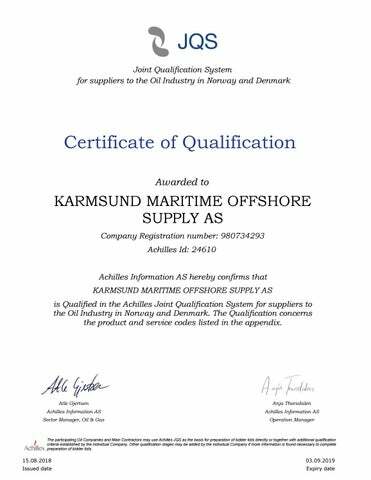 Achilles Information AS hereby confirms that KARMSUND MARITIME OFFSHORE SUPPLY AS is Qualified in the Achilles Joint Qualification System for suppliers to the Oil Industry in Norway and Denmark. 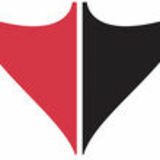 The Qualification concerns the product and service codes listed in the appendix. The participating Oil Companies and Main Contractors may use Achilles JQS as the basis for preparation of bidder lists directly or together with additional qualification criteria established by the individual Company. Other qualification stages may be added by the individual Company if more information is found necessary to complete preparation of bidder lists.